Mmm, delicious, plot relevant donuts. The penultimate episode of Nisemonogatari takes Koyomi on a simple fact finding mission to a trip back home that would change the way he looks at how he viewed the world. He takes Shinobu on a trip to the Mister Donuts shop that she loves so much in exchange for getting information on Kagenui and Ononoki. Conveniently, Kaiki is also there which allows him to learn that Kagenui is an onmyouji. He returns home to find the 2 of them camped outside oh his home waiting for a surprise target. First of all, Koyomi is a pervert. We’re talking the Lionel Messi of incestous perversion here. It just happens to be relevant to the plot this time. He notices something just a little bit off with Tsukihi and he strikes. Off comes the yukata and within seconds he’s on top of her inspecting her minimally clothed body. So she had no scars on her, which raises some questions and he probably could have stopped there. Yet, he just decides to grab one of her breasts simply because he could. So much for lasting memories. Then there is the contrivance of two of the conversations. 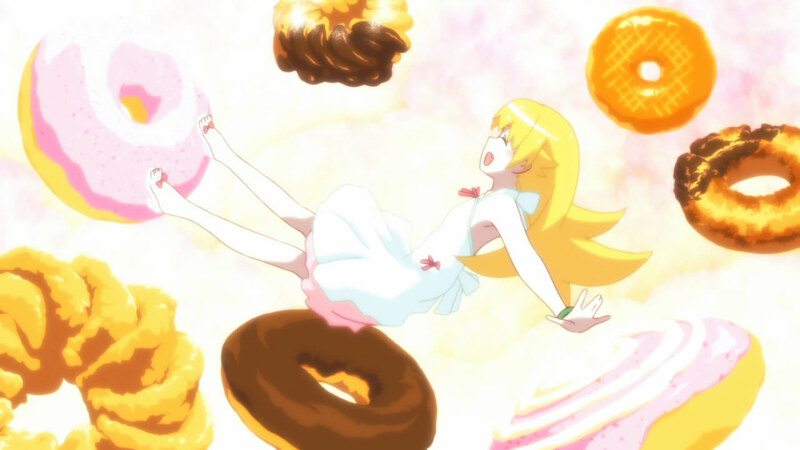 The episode opens with Shinobu informing Koyomi of the 100 yen sale at Mister Donuts. So that provides the excuse to go to the restaurant, but wouldn’t Koyomi have known that already? Regardless, it provides an opportunity for him to talk to Oshino’s de facto replacement. Oh, and the man he chased out of town also happens to be at the very same restaurant. What a coincidence. I suppose I can’t really criticize it too much, since I just praised Pirates for combining plot and fanservice in one scene. 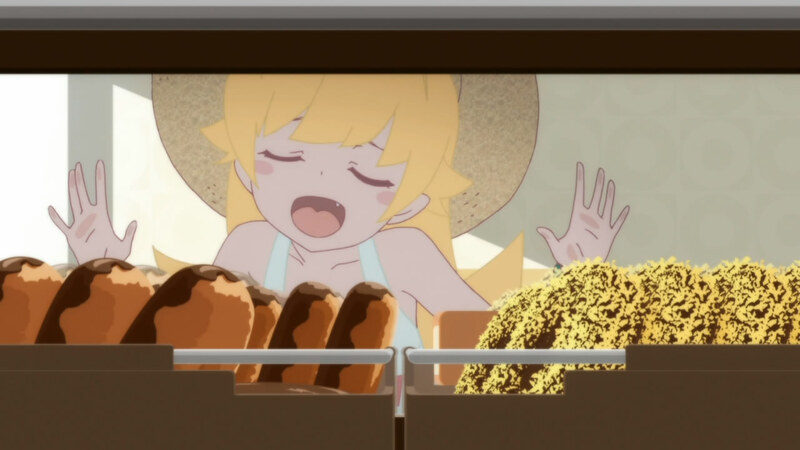 I just think it could have been done better and not as drawn out as Shinobu drooling over the selection of donuts because that’s what is supposed to be appealing to her. At the end of the episode when she takes command of the situation, that is what she should be. You know, I think that's going to hurt a bit. 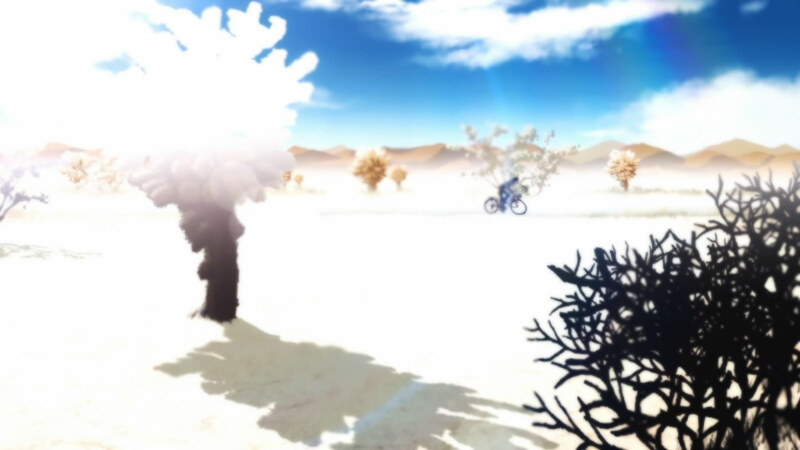 Finally, at the end of the episode we get the first action sequence in the entire season. 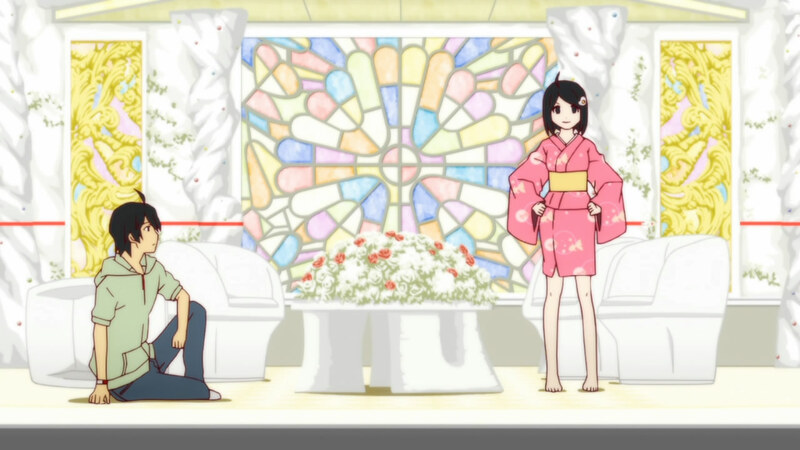 Kagenui and Ononoki show up at Koyomi’s house, he isn’t really the target, Ononoki vaporizes most of Tsukihi’s body when she answers. 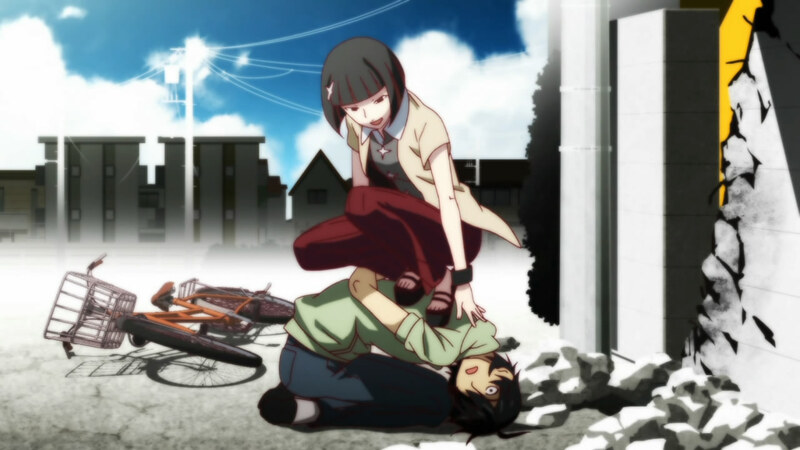 Koyomi goes into an extreme rage, but is restrained by Kagenui. He then discovers that Tsukihi is actually immortal as her body has regenerated. Because of Shinobu’s obvious bluff, Kagenui agrees to give him time to think things over before they finish the job on Tsukihi. This is where some of Koyomi’s earlier statements come back to haunt him. Being right doesn’t matter without strength, so he can’t really continue to fight against a vastly superior opponent like Kagenui. However, we all know he’s going to try anyway, because Koyomi is a hypocrite. We'll let you go this time, but next time she's mine. Koyomi is a hypocrite willing to defy his own beliefs to protect those close to him, that’s why he has his harem after all. He went through the effort of eliminating the fake that is Kaiki to having to fight against people who are also eliminating fakes because they see it as the right thing to do. Koyomi’s getting a lesson on the world not being as black and white as he thought it was. Tsukihi’s new obsession of others growing up and leaving her behind also has an explanation. She’s immortal and probably wants to keep relationships where they are at without moving on. That’s why she gets upset when other people change, because she can’t grow up. Ironically, she expresses her greatest frustration at the person who may also be immortal. So one episode to wrap this up. Hitagi has to make a reappearance; probably at the end of the next episode, as well as a few conversations. Maybe it just ends up being Kagenui convinced that nothing wrong is happening so they should go away and let them live their own lives. Or maybe this gets pushed out to more online episodes like Bakemonogatari. 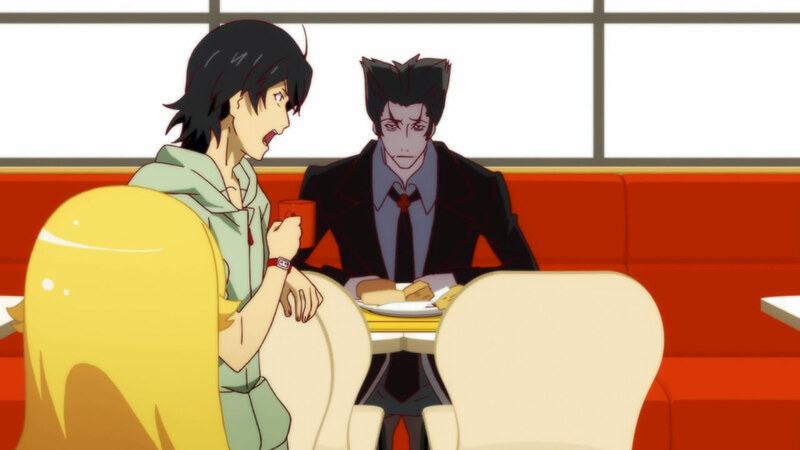 Araragi and Shinobu don’t share thoughts, they share feelings so he wouldn’t necessarily know about the doughnut sale. They’re not the same person after all, they’re just stuck together. Also considering how deliberate Kaiki’s actions are and the fact that Kagenui knows about Araragi and his sisters, it’s pretty much implied that he sold information to the onmyouji which is his reason for being back. Also Araragi is much more cynical than you give him credit for, he’s mentioned multiple times he doesn’t like being called a hero and his words are as much meant for Karen as they are for himself. He’d just as soon lie to his sister to keep her from making a bad situation worse which is exactly what she was about to do before he stopped her. It’s not that I’m arguing they share thoughts, it’s more a case of thinking that Koyomi willfully ignored the sale’s existence in order to make that line work since he would have also had to have seen it. Kaiki could have well sold the information off as he would probably sell off his loved ones for any extra money. Koyomi is indeed cynical. Being called a hero thrusts responsibility onto him. He’s generally the opposite when it comes to daily conversations, but when it comes down to it, he’s pragmatic as you say. He’d just as soon forget what he said if it meant protecting those he cared about. About time that there was some sort of plot relevant action/supernatural combat in this show. I’ve missed it among the bucketloads of service. Its quite different in that regard to Bakemonogatari. 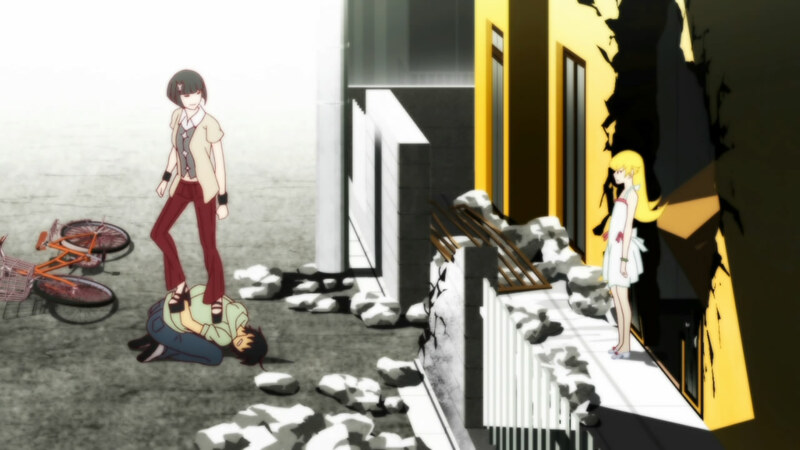 I actually enjoyed Araragi getting completely overpowered. I think he was getting a bit cocky and overconfident. Your mention of Araragi as the Messi of incestous perversion has had the unfortunate effect of me picturing poor Tsukihi in a Bayer Leverkusen shirt. It was really surprising that with all he had dealt with in the first season was small stuff to Kagenui. It will be nice to see him go up against someone he really shouldn’t be able to beat. As far as the football shirts, I suppose there are enough teams torn apart to give all of the girls in this series their own shirts. Me, popular? There’s absolutely no chance of that. I’m pretty sure on average you get more comments on each post than I do.